To Edit Salesforce information, select the record on the ZynBit task pane by using the appropriate green ACTIONS (or A) icon. When the ACTION icon at the Contact level is selected, a menu with Contact actions appears. The first line reinforces the ACTION chosen by the label “Edit Contact”. If the Account ACTION is chosen, the first entry shows as “Edit Account”. 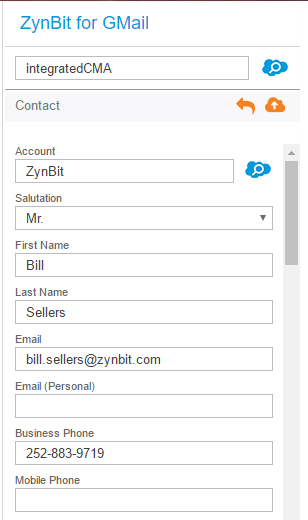 When the Edit Contact option is chosen, the ZynBit task pane will display all the fields available in Salesforce (in the order defined in Salesforce) and edits can be made. After the record is updated, select the icon at the bottom of the task pane to save the changes in Salesforce.